Polls have opened in Germany with Chancellor Angela Merkel vying for a third term in charge of Europe’s most powerful economy. 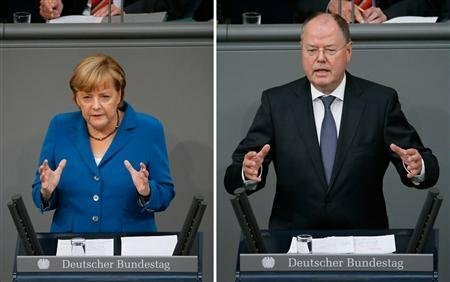 Angela Merkel’s Christian Democrats may take the largest number of seats in parliament, or Bundestag, according to latest polls. But Angela Merkel’s coalition partners, the Free Democrats, may not gain the 5% vote share required to win any seats. If so, Angela Merkel may have to consider a coalition with her main rival Peer Steinbrueck’s Social Democrats. Voting opened at 08:00 local time and is due to close at 16:00. In Berlin, Angela Merkel asked for votes to continue with her government’s policies into 2017. “The voters decide, not commentary beforehand,” he said. The Green Party – who may play some part in an eventual governing coalition – has criticized Angela Merkel’s government for raising taxes. If the FDP do badly, as expected, the CDU/CSU may find themselves looking to other small parties to form a broader, more fragile coalition. With the biggest population of any EU state, Germany enjoys a GDP that far outstrips the economies of its partners and is crucial to decisions on tackling the eurozone’s debt crisis.